We have exquisite petticoats and skirts and costumes for Mardi Gras 2015. MardiGras skirt plus size, mardi gras skirts costumes in Green/Yellow/Purple Colors. 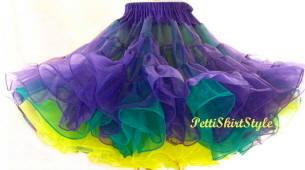 Adult size and child teen size skirts in purple, yellow and green for Mardi Gras Parties New Orleans 2015. Gorgeous organza 3 layers of WOW. Made in USA, will last forever. Highest quality petticoat skirt there is. 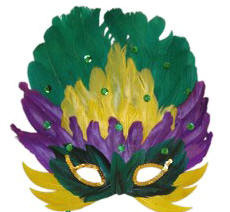 Dress up for Mardi Gras, Fat Tuesday New Orleans Style. Imagine getting Café Olait and Benet Biscuits in this little number! The skirt comes in 3 lengths. Above knee and below knee. Plus Size Waist too!